I'm really proud to share this review of the Giant Awakening Self-Mastery Mountain Retreat written by Keith McGuinness, a member of the Tribe that formed on the July '17 retreat. If this speaks to you and you want to get involved in a future retreat, check here for upcoming dates. N.B. Upcoming retreats will be have a different schedule and accommodation, based more in Tollymore Forest than the Mourne Mountains. Billed as Wim Hof Method Weekend Retreats it will have a deeper focus on breathwork practices and mindset and cold immersion. I’ve a confession to make. If I had known we were going to scale the tallest mountain in Northern Ireland during the Causeway Living retreat, I probably would have pulled out. That sums up how much confidence I’ve had in my body recently. I suffer from two incurable (but thankfully not life- threatening) medical conditions- asthma and Crohns. Fortunately, both are mild, but they’ve held me back in the past (and Crohns continues to do so). Then, just before Christmas 2015, I started suffering new symptoms. I was experiencing light-headed spells and a complete lack of energy. My automatic response was to blame my Crohns, but my consultant ruled that out. I spent a few months fretting about what could be wrong with me until a friend insisted I speak to a nutritionist. Slowly but surely, I got to the bottom of the problem. Years of abusing my body- sugar overload, fast food and binge drinking- was catching up with me. I never shed the two stone I put on in six months in Texas when I was 21, and piled another stone on top. More recently, a foot injury suffered playing football removed the outlet of physical exercise, while disillusionment with my career (and life in general) was weighing on my mind. I was severely run down. So I went on a strict diet over the summer and shed three stone (I’ve since put one back on). I cut out the fun stuff- alcohol, sugar, gluten and dairy, and I changed my lifestyle. Part of the problem was I rarely got a good night’s sleep because my flat overlooked a tube station. The commute into the city wasn’t helping either. So I packed in an extremely lucrative contract and moved to the south coast of England. I also explored a variety of therapies or practices that might aid in my recovery, including yoga and hypnotherapy (and lately the Wim Hof method), and meditated consistently. It’s been a tough journey- it’s still in progress- but I felt there was something missing. My nutritionist astutely pointed out I had completely lost faith in my body. I was scared I’d take several steps back if I restored a particular food to my diet and my system didn’t tolerate it or pushed myself too hard physically. So Scott’s retreat came up at just the right time. I met Scott thanks to a Facebook friend called Tone who I had connected with during the Flow Fundamentals course in September 2016. Tone posted a picture with an Irishman in June of this year and as a Dubliner born and raised, it caught my eye. I read Scott’s story and in many ways it mirrored my own, so I dropped him an email and appreciated his sincere reply. When I saw the adverts for the retreats, I penciled myself in for the one in September, but only after peppering Scott with questions about how physically demanding it would be. At that stage, I reckoned I had a couple of months to continue with my recovery and get into shape. Then a spot opened up on the first retreat at the end of July, and I nervously signed up. After arriving at the Mourne Lodge on the Sunday evening, we settled into our room. You read that right, one room with six single beds. Again, I must admit I wasn’t thrilled at the prospect of sharing with people I didn’t know (or anyone for that matter), but in hindsight it added to the whole experience. Scott then went through some breathing exercises before we introduced ourselves. We all had a story to tell, but we also had one thing in common- we were confronting our challenges, rather than shying away from them. Realising I would be surrounded by such an inspiring group for the next couple of days was the first sign I had made the right decision. The second day began with putting into practice the Wim Hof method before we set out for Slieve Donard, Northern Ireland’s highest peak. We started hiking at 10am, and within an hour and a half we were confronted with our first ascent. It looked challenging but I convinced myself to take one step at a time, and I was pleasantly surprised at how easily I managed to make the plateau. We stopped for lunch before tackling the second leg to the summit. It was much tougher but the view when we got to the top- not to mention the sense of achievement- was worth every ounce of effort. The descent was more mentally demanding than physical, as we had to focus on our footing to avoid falling over. It only took about half an hour, although we still had a couple of hours walking ahead of us until we reached the spot Scott had scouted for our first exposure to the cold water. You can never account for the weather in Ireland but for once, Scott probably wished the day was a bit cooler. However, it was a scorcher and the stream at the bottom of the mountain was busy. Luckily, our spot was fairly secluded, so we didn’t have to contend with a bunch of teenagers drinking cheap beer. I volunteered to go first, and the cold water was a treat after walking in the heat for several hours. We ended up hanging out in a shallow pool for a while (as you’ll see in the photos) before heading for a dip in the sea. The hike to the lough on the third day was gentler, taking about an hour and a half. It was a stunning setting for our second exposure to the cold, surrounded by the mountain range. The whole group entered the water together this time, which brought a sense of bonding to the experience. It was much colder, so we felt like we made up for the previous day. My biggest regret from the retreat was forgetting my breathing exercises as I lowered myself into the water and once we were submerged, but I put that down as a rookie error. I was glad I brought extra layers as typically the hot weather didn’t last, but I warmed up pretty quickly as we ate lunch by the lake before heading to the lodge for a very welcome shower. My intention going into the retreat (and over the preceding twelve months) was to recover and come back stronger, and I feel like it helped me take massive strides in that direction by restoring faith in my body. In hindsight, not knowing about the extent of the hike up Slieve Donard worked in my favour because I didn’t give myself an excuse to cry off. I now realise I’m physically capable of much more than I thought possible a couple of weeks ago. 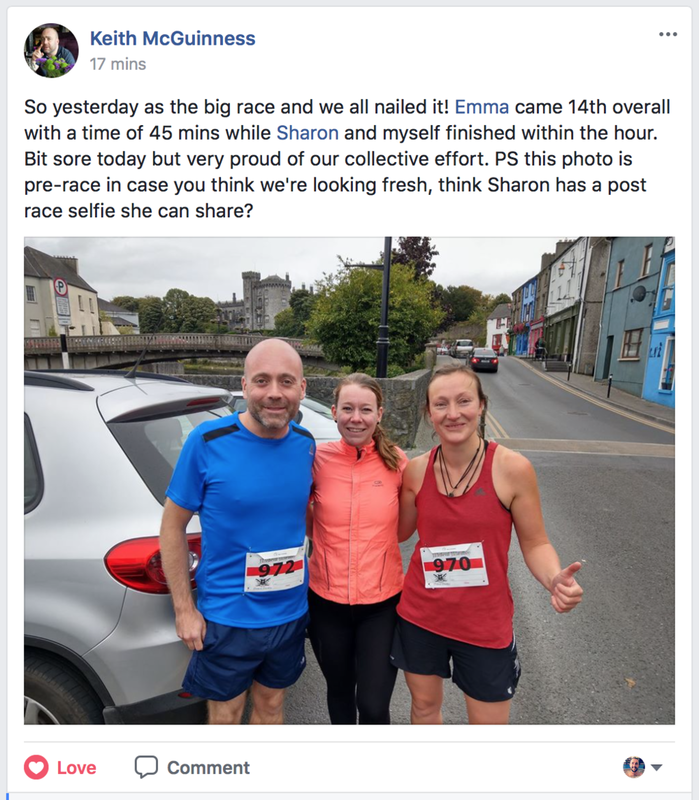 My next challenge is to keep up the momentum, so I registered for a 10k race in Kilkenny in September with Emma and Sharon who were part of the group. I’m nervous about whether I’ll be able to train properly and complete the race, but I wouldn’t have contemplated signing up for it before the retreat. The experience also reminded me how important it is to surround yourself with like- minded people. While Scott’s passion for self-mastery inspired the retreat (and his meticulous planning ensured it ran smoothly), the group dynamic played a big part too. We ended up learning a lot from each other- our backgrounds were diverse (there were four nationalities among the six of us), and we’re at different stages of our journey, so we all had something unique to contribute. I’d like to thank Scott once again for organising the retreat and Emma, Kaja, Karolina and Sharon for sharing the experience with me. If you’re reading this and thinking about signing up for the next one, don’t hesitate. It’ll be worth every drop of sweat and every second of exposure to the (hopefully) cold water. I hope you enjoyed reading this account of the Giant Awakening Self Mastery Mountain Retreat. I'm so proud of Keith's effort and progress not only on the retreat, but integrating the lessons from the adventure and applying them to his life beyond the Mourne Mountains - signing up for a 10k race and continuing to build on the positive momentum he's generated for himself. I'm very proud to share that Keith has successfully completed the 10k race with his fellow July, Giant Awakening retreat-mates, Emma and Sharon. By reuniting months onward to overcome another challenge and growing together, I can see by their actions that they've really integrated 1 of the 3 Pillars of Strength that we focus on during the retreat: Human Connection. I can't explain how much it means to me to witness this, and they serve as a great example to others interested in the Giant Awakening Mountain Retreats that you'll learn, grow and take a lot value from it back to the rest of your life.